Mosquito treatments will drastically reduce the amount mosquitoes around your home so you can enjoy the outdoors once again. Certified Home Services Mosquito treatments targets where the adult mosquitoes are . 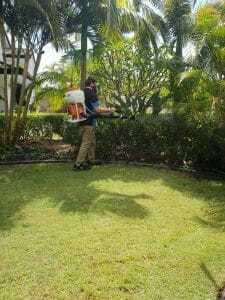 The treatment involves treating all foliage , grass areas using a misting machine which delivers the best results . The mist gets under the foliage where the mosquitoes rest during the day. Killing adult mosquitoes with regular mosquito treatments will give you between 3 to 6 weeks relief . The treatment will significantly reduce the amount of these nuisance pests so you can enjoy the outdoors again.To Keep on top of the problem we recommend 4 weekly services. The treatment also reduces the amount of Midges and spiders and ticks. Removing potential mosquito breeding sites. Mosquitoes lay eggs in containers found around your home, so extra care needs to be taken to remove containers and rubbish from around your house. Killing adult mosquitoes with regular mosquito treatments — treat in dark hiding places, such as under furniture, inside cupboards and behind curtains. When you Venture outside make sure you apply a Mosquito Repellent to keep the mosquitoes away. Lemon Eucalyptus is a great mosquito repellent. How To protect against Mosquito Bites and reduce the risk of Mosquito diseases they transmit. ( In Australia Ross River, Dengue fever and Zika virus ) Many types of adult mosquitoes are found resting in vegetation and shaded areas during the day time. Check screens and seals on rainwater tanks. Those Water tanks are a great breeding site for Mosquitoes. Your gutters need to be regularly cleaned to prevent mosquitoes from breeding. Do a Regular Check for anything that can hold water and remove them , eg : Old tires , buckets , toys , tarps etc . These areas are great breeding sites as the female mosquito only needs a little water to lay her eggs. Also Clean drain sumps regularly and ensure water drains well and doesn't pond. When you do these things and this will let you get outside and enjoy our great Weather here in Queensland. Also You can book a Termite inspection and include a pest control and will only cost $295.00 saving $85.00.